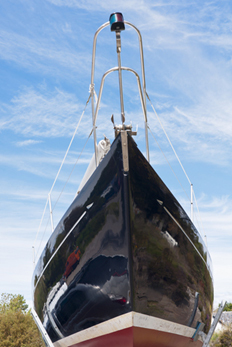 Isinglass is the general name used for your boats clear plastic windows. Isinglass is very sensitive to scratches from abrasive materials & harsh cleaners. Using everyday household cleaners Will Damage the sensitive plastic, and paper towels or other non-mircofiber towels Will scratch your isinglass, so be extremely cautious. Be sure to check with a professional for the proper products and procedures to ensure clear sightlines for both you and your passengers for years to come. We first hand wash with fresh microfiber cloths to remove the dirt and salt. We then select a polish specifically formulated for isinglass restoration then apply and buff. The process involves many repetitive wipings in both vertical and horizontal directions and may require removal of the panels from the boat and machine polishing. The procedures we employ will also remove most ultraviolet (a yellow/brown discoloration) damage unless the discoloration has permeated the vinyl to such an extent that replacement is required. Never use alcohol, ammonia, RainX or any other chemicals on your isinglass as they will accelerate discoloration, degradation and promote drying leading to tearing and cracking. We recommend and use only Plexus as part of routine maintenance to protect and keep isinglass supple. YOLO Yacht Services offers free estimates, for Isinglass Cleaning & Restoration at reasonable prices and ongoing personalized maintenance plans. Let us do the hard work and take the drudgery out of your life. When the day arrives when you decide to sell, show your service records to prospective buyers to let them know YOU CARED! Contact us today for a free no hassle estimate! Can I detail my own boat? Do I have the physical ability to constantly bend, stoop, kneel, push, twist, reach, climb, walk, stand, grasp, crouch, lift, and engage in repetitive wiping motions? Can I do these tasks from various angles and body positions for long periods of time during the heat of the day? Do I have the right tools and supplies for the job? If not, what will be my costs? Can I operate a machine buffer with the proper technique to remove oxidation with minimal swirl marks or burning the gelcoat? Do I have the time and patience to do the job, learn the processes and procedures, and to acquire the most appropriate and suitable products and chemicals? The tools and supplies you will need will vary and should be the most appropriate for your boat. 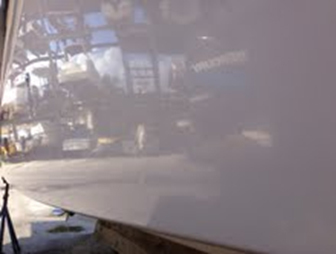 Let’s assume your boat is not too far gone requiring a multi step wet sanding process, but it still requires a bit more than a two step micropolish and wax. If this is the case your boat will need a good compounding. The compounding product, pad and technique should take into account how much of the gelcoat needs cutting to remove just enough to get down to a clean flat surface. While it is certainly relatively thicker than automotive paint, gelcoat is nonetheless quite thin. Using the right compound requires product knowledge and sometimes requires mixing two products together to get the best result. Think in terms of sandpaper grit levels and you’ll get the idea. Going harder or heavier in some spots and/or using too many passes with your machine may result in refraction (a visual phenomenon based on surface medium changes) and possibly losing forever that true mirror like finish. And, heaven forbid, cutting to deep may expose the underling fiberglass. The medical credo “first do no harm” certainly applies to yacht detailing. On the opposite spectrum, press too lightly, use a poor technique or too soft a foam cutting pad and you’ll accomplish less desirable results. The likely outcome will be sealing over microscopic pores during the wax application resulting in degradation and the premature reappearance of chalky oxidation…”white rust” if you will. We suggest you first do some test spots in a few taped off 2’ x 2’ squares using different compounds and cutting pads while literally “dialing in” the rpm speed dial on your buffer. Our choice of buffer is Makita. Dewalt, Porter Cable, Fein and Flex are also very good machines. Stay away from the cheap stuff because power, efficacy, shelf life and decibel levels really do matter. A do it yourselfer should expect to pay $300 -$500 or more on the buffer, backing plates and pads alone. The average retail price for a quart of 3M’s Imperial Compound is about $50. Now add the prices for polish, wax, soap, cleaners, degreaser, removers, protectants, repellants, and an assortment of brushes, chamois, sponges, Scotch pads, and cloths for a rough idea of your total outlay. YOLO Yacht Services offers free estimates, reasonable prices and ongoing personalized maintenance plans. Let us do the hard work and take the drudgery out of your life. And when the day arrives when you decide to sell show your service records to prospective buyers to let them know YOU CARED!